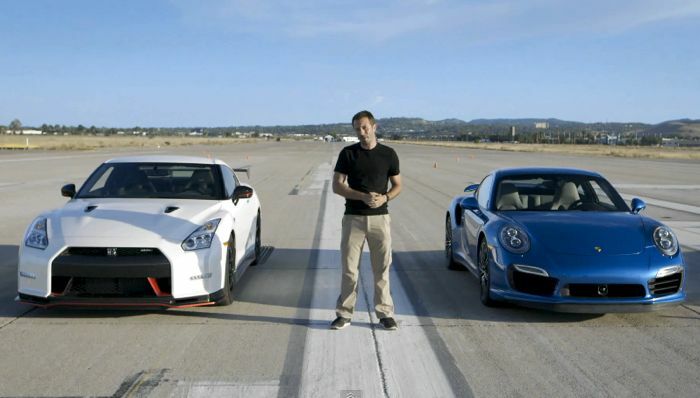 The guys from Motor Trend have put the new Porsche 911 Turbo S up against the Nissan GT-R Nismo in their latest ‘World’s greatest drag race video. The race is really between the Porsche 911 Turbo and the Nissan GT-R Nismo, but they added in some more performance cars just for fun. The full list of cars in the race include an Alfa Romeo 4C, BMW i8, BMW M4, Chevrolet Camaro Z/28, Ford Fiesta ST, Jaguar F-Type R Coupe, Nissan GT-R Nismo, Porsche 911 Turbo S, Subaru WRX STI & Volkswagen Golf GTI, have a look below to see which one won. As you can see from the video the new Porsche 911 Turbo beat the Nissan GT-R Nismo, but not by much, it is interesting to see how some of the other cars perform as well, when they are all side by side.